I made up this site to share some stuff related to my two most special interests- surfing and performance driving. Many thanks to John Dunkle for making this free Web space available for Rennlist members. I'm not a computer professional, but I have been messing with PC's since 1983 or so, and I can appreciate the kind of effort it has taken to develop and maintain the Rennlist site. Though it grew from a simple Lyris listserver into the largest Porsche marque site on the internet and John eventually sold it to Internet Brands, as one of the original founding members, I am grateful that he negotiated an agreement with them to honor his commitments to members in the transition. 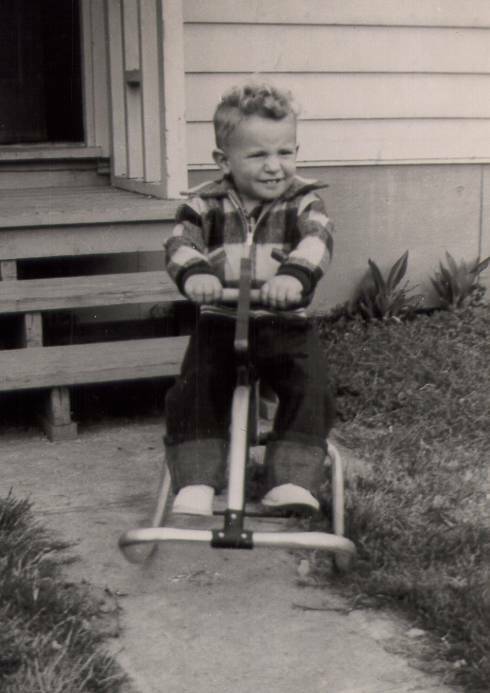 I have some pics of my family, taken over many years time, on a couple of pages here. The first access I ever had to the Internet was generously provided by my friend Joe Trotter, through a server that he was administering at the Salk Institute back in the early '80s. Joe created one of the first surfing-related websites there, to which I contributed some content, and he has maintained it to this day, long after he has left Salk for greener pastures. "Surfing the Web" has become a common phrase, but real surfers are a little upset that their sport has been co-opted to describe what is basically an inactive, sedentary pursuit. We think that "Fishing the Web" would be a more appropriate metaphor. http://adaywithba.com/ -- that should be enough real surfing content to keep you "fishing" for awhile! In 2013, The California Surf Museum mounted an exhibit celebrating the 50th Anniversary of my surf club, for which I wrote the narrative explaining the exhibit to visitors. I have always been interested in writing, and have been working on "The Great American Surf Novel" since I was in college in the late '60s. After retiring from my "real" job, I disciplined myself to sit down and actually finish it! It's called Beep! Beyond the Frogpond and Back. My wife and I have started a publishing company as a second career for our retirement years and we have nine books published already, with two more in production. The company is named Plowshare Media, and I would like to invite you to visit our website to learn more about our work. This is a picture of my 1966 911 sunroof coupe, which I bought in 1997. It was modified with all 1967 911S running gear, plus small flares, doors and chin spoiler from '69-73, sport seats, Autopower rollbar w/ 5 pt. Simpson harnesses, 6" Fuchs w/ 205/60-15 Dunlops, etc.) It was taken during an autocross at the EVOC (Emergency Vehicle Operations Center) in Riverside, in 1998, the first time I ever won my class. Since then, I have sold this car to fellow Rennlister Terry Steer in Australia, and it has begun a new racing career Down Under. Some of my other cars, past and present, are depicted below, with links to the stories behind them. This was my father's 1967 911S, and I became the 3rd owner of it, after him and my brother, in 1999, driving it constantly until the end of 2007, when I sold it to a fellow in Holland, who will be using it for vintage rallies and European tours. The detailed description and history page I made up for it when I decided to sell the car is here. I picked up this 1973 911E in late 1999, and began modifying it towards and beyond 911RS specs. Many thousands of dollars and many track miles later, I sold it to a fellow in Sweden before I ever did the final paint work. It was mechanically perfect and fully developed as a street-legal time trial, DE, and autocross car, though, and the new owner has finished the body and paint work to his tastes, now, and it will be enjoying a new racing career in Europe this summer. After 5 years of Porsche driving, I decided I would like to get some seat time in a different kind of vehicle, something cheap and quick and fun, so I tried a 125cc shifter kart at Amago Raceway one day. It beat me up, literally. The G-forces and pounding I took were exhausting. In 30 laps, I was toast. I decided I needed something a little more comfortable, with at least a suspension and some seatbelts, so I bought a Formula Ford. It's a 1976 Zink Z-10C, and it hadn't raced in 10 years, but I spent a few months going through it and finally got it out on the track and it is a blast to drive. of course it is not street legal, so then I needed a trailer to transport it to events, and a tow vehicle for the trailer, and it goes on and on.... KAAACHIIINGGGG! Eventually, I sold this car to a racer in Arizona who had just flipped his Zink several times at Firebird Raceway, and needed a replacement chassis in a hurry to continue his racing season. He contacted me through a mutual friend I had met at the SCCA Solo2 National Tour event in San Diego, drove over from Phoenix, looked at the car, and we made a deal on the spot. I delivered it to his home on the way to Texas to pick up the Ultralite S2K within a week. In 2007 I acquired something as close to a supercar as I will ever get, being a retired working stiff of modest means. It was an Ultima GTR--an English built "kit car". It has a mid-mounted 350ci Corvette LSx engine driving the rear wheels thru an inverted Porsche G50 transaxle. This is a pic of it with the 2008 Porsche RS Spyder, taken by Randy Wells at a private track day at Willow Springs, CA, I was attending. 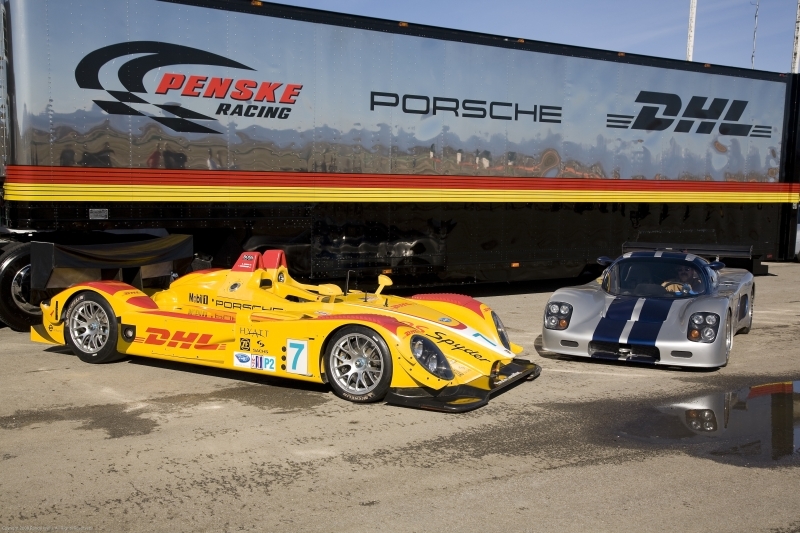 The Penske team was there for some testing sessions, and allowed us all to have pics taken next to the RS Spyder. Click on the pic for my photbucket album of the car. After the Ultima, I had a 1991 Porsche 964 Cup car for several years. It was a factory race car, not street legal, and had been highly modified over the years, with 993 GT2 Evo bodywork, a 3.8 liter engine, and a G50 6-speed transaxle. 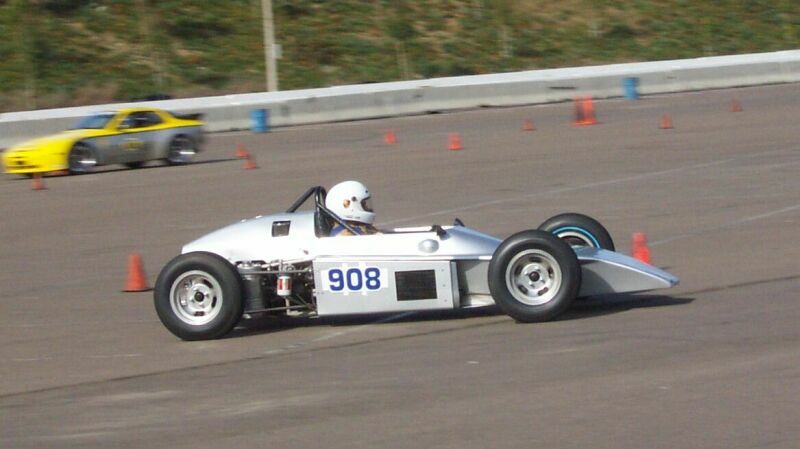 The image below is a link to a Photobucket album of pics of that car. It has since returned to Europe for a new owner to enjoy in vintage racing. 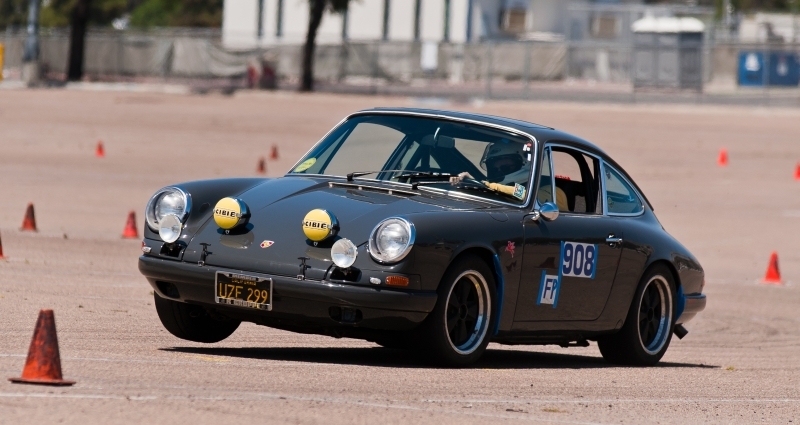 My last air-cooled Porsche was a 1968 911 that I rebuilt over a period of about 5 years into an R Gruppe hotrod. It had a Euro 3.0 liter engine mated to a 915 5-speed transaxle, and was very quick, since it weighed only 2200 lbs. 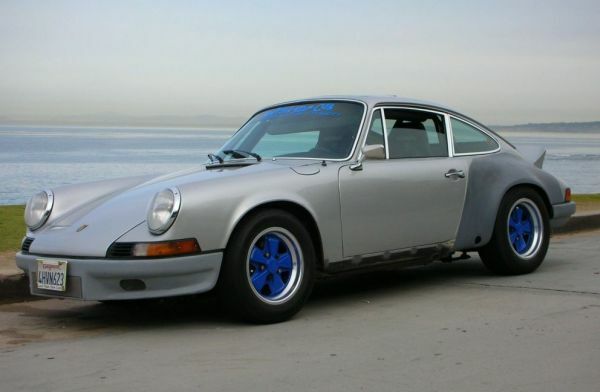 It was originally Sand Beige and I painted it Slate Grey, my favorite early Porsche color. 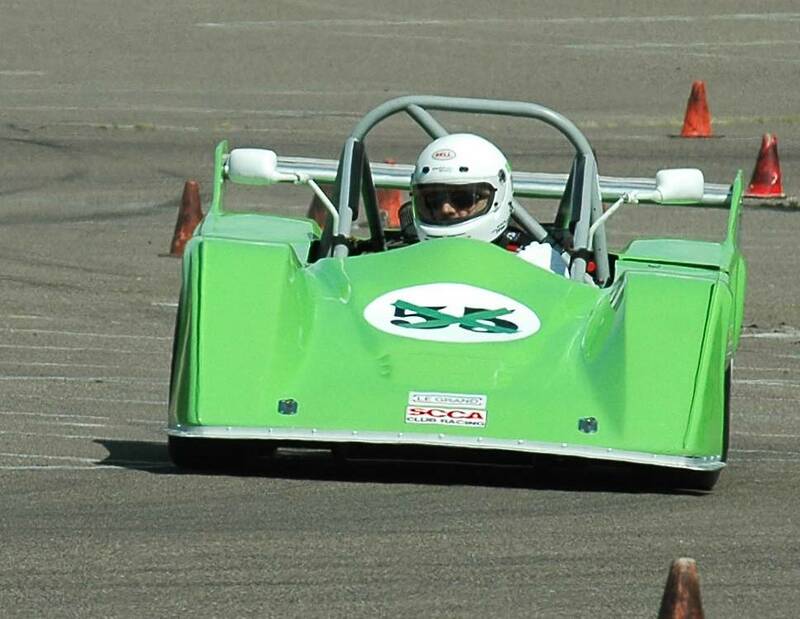 I won four straight class championships running it in PCA autocross events. The picture below is a link to a photobucket album for that car. It was finally sold to a collector in Alabama. I'm afraid age and infirmity are catching up with me now, and I am not able to work on or drive my cars so intensively anymore. Though I was always an avid fan of the air-cooled 911, I decided to sample the modern water-cooled offerings from Porsche, something utilizing all the latest technology (and carrying a factory warranty, since repairing them myself is no longer feasible). I wanted to try the mid-engine Porsche layout, so I found a lightly used and highly optioned 2011 Cayman S with PDK 7-speed. It is a very quick car that handles extremely well, even though it weighs 1,000 lbs. more than my '68 911 did. It has about 100 more HP, so that evens things out, and the mid-engine weight distribution plus much larger tires makes for high levels of grip. Though I have given up driving on the big tracks now, I still enjoy autocrossing and the Cayman is a very capable car for these precision driving events. 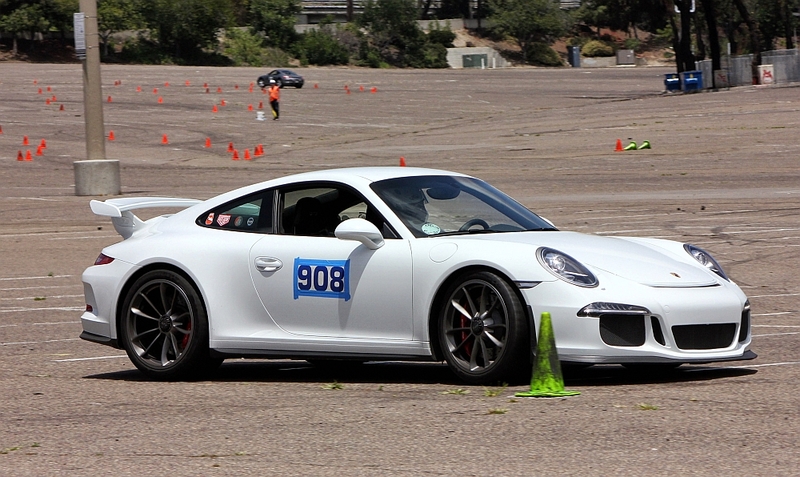 In 2015, I decided I missed the rear-engine driving dynamics of the 911, and purchased my dream car, a 991 GT3. This car is everything I want in a sportscar, and makes me smile every time I drive it. It's a keeper, and I think my dabbling in cars is over. I will just have my wife bury me in this one.